A middle school in the north-central province of Quang Binh, where a teacher last month asked classmates of a student to take turns in slapping him a total of 230 times for “swearing” in class, has stirred further public anger by asking those concerned to detail the event in a questionnaire. 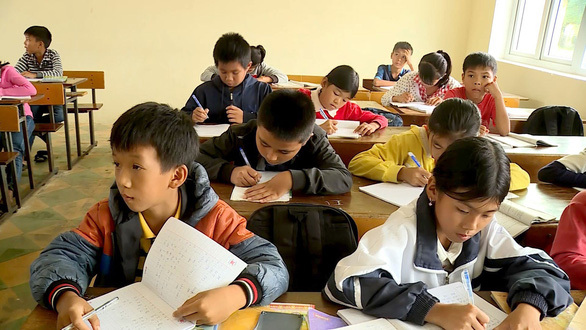 A sixth grader at Duy Ninh Middle School in Quang Binh was hospitalized in late November after he was repeatedly slapped on the face by his classmates as a punishment from his teacher for allegedly using foul language in the classroom. The math teacher, Nguyen Thi Phuong Thuy, asked the whole class to give the student ten slaps each after he was accused of “swearing” by another classmate. Thuy has been suspended from work pending her final punishment, while Quang Binh police officers have launched legal proceedings against the case on “torturing” suspicion. The incident triggered public anger and criticism aimed at Thuy not only for her encouragement of violence among young children but also for teaching them to be indifferent to the suffering of others. Instead of addressing these issues, leaders of Duy Ninh Middle School on November 24 handed out a questionnaire to 23 students who participated in slapping their classmate, asking them to detail the event, the school headmistress Pham Thi Le Anh confirmed to Tuoi Tre (Youth) newspaper on Monday. Students were also asked to write their name on the questionnaire. After getting answers from the students, headmistress Anh compiled a report and submitted it to the local education bureau, where she said out of the 23 students 13 slapped N. slightly, eight slapped N. with medium strength, and only two slapped N. hard. The report also pointed out that a cousin of the victim, who is one of his classmates, did not cry after slapping N., in an apparent attempt to undermine the severity of the problem. The controversial questionnaire and report have attracted a universal rebuke from education experts and social media users, who agree that the insensitive move has only worsened the situation. Some say the school’s response has done little more than encouraging students to lie and not to take responsibility for their action. Furthermore, such interrogation-like questions are not necessary considering the fact that police have already launched an investigation into the case. “I don’t understand the school’s purpose in handing out such a questionnaire,” said Dr. Nguyen Tung Lam, president of the Vietnam Association of Psychology and Education in Hanoi. “That a schoolteacher asked students to slap their own classmate, whether it resulted in ‘red cheeks’ and ‘crying’ or not, is dead wrong.